Historically, a number of different SNP typing approaches have been used in both research and clinical laboratories. One of the first approaches for SNP typing was polymerase chain reaction-restriction fragment length polymorphism (PCR-RFLP), which can be used for genotyping when a SNP creates or abolishes a restriction site. The technique is performed by amplifying the region of interest with flanking primers, followed by digestion of the PCR product with the appropriate enzyme and resolving of the products by gel electrophoresis. This approach has been commonly used (23-26), even in instances where the SNP does not alter a restriction pattern through the use of PCR-mediated site-directed mutagenesis (27-31). This derivative of traditional PCR-RFLP uses primer modification along with the SNP to create/abolish a restriction site. The primary weaknesses of this approach are its labor-intensiveness and the fact that no or incomplete digestion of the PCR product can lead to erroneous results; however, additional endogenous or engineered restriction sites within the product can serve as internal controls for digestion. Allele-specific PCR (ASPCR), also known by amplification refractory mutation system (ARMS) or PCR with sequence-specific primers (PCR-SSP), is based on the fact that Taq polymerase will less efficiently extend an oligonucleotide primer when the 3' end of a priming oligonucleotide is not perfectly matched with its target template (32-34). As a result, primers can be designed that discriminate single-base substitutions, small deletions, or insertions. Assays are typically arranged in a two-reaction format for biallelic systems where each reaction possesses primers specific for detection of a single allele. The assay end point is typically electrophoretic analysis of the reaction products, and detection of the appropriately sized product is indicative of allelic presence. Fig. 1. 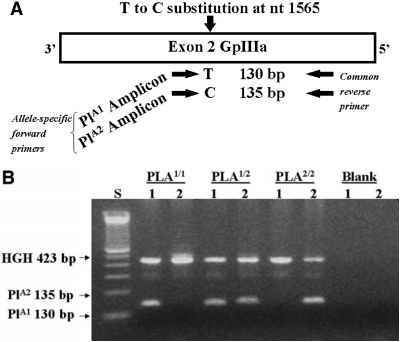 Genotyping the T1565C (PlA1/A2) dimorphism of the GPIIIa (platelet fibrinogen receptor) gene by allele-specific PCR. (A) The two-reaction format: Allele-specific forward primers are paired with a common reverse primer for amplification of either the PlA1 allele (T at 1565) or PlA2 allele (C at position 1565). A second pair of primers, specific for the human growth hormone locus, are included in each reaction as an internal positive control. After amplification products of each analysis are run in pairs (B), the PlA1 reaction is in the first lane of each pair and the PlA2 reaction is in the second lane of each pair and Product sizes and genotypes of illustrated examples are indicated. Lane S: 100-bp DNA ladder (Gibco-BRL Gaithersburg, MD). Coamplification of a second (uniquely sized) product is often used as an internal control, so that technical failure is not confused with absence of the allele (Fig. 1A,B). 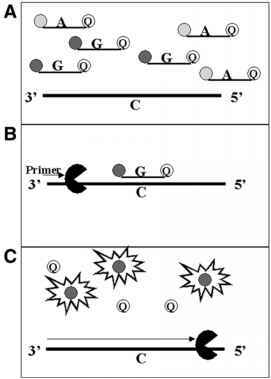 The specificity of the allele-specific primers can be enhanced through the introduction of additional primer-template mismatches at the -3, -2, or penultimate nucleotide; this additional destabilization of the 3' end of the primer reduces mispriming of the genomic DNA target during the early cycles of the PCR reaction (33,35). Application for this typing approach was first reported for detection of the A to T transversion of the human P-globin gene responsible for sickle cell anemia (34). Since then, this approach has been broadly applied in both the research and clinical laboratory for typing of hematologic antigen systems (36-43), mutations associated with thrombotic or cardiovascular risk (35,38,44-48), HLA typing (49-54), a1-anitrypsin (32), and steroid 21-hydroxylase (55). The advantage of this approach is that it is less labor-intensive than PCR-RFLP in that no postamplification enzymatic digestion is required; however, considerable reaction optimization can be required. More sophisticated derivatives of this approach have been reported, including multiplexed allele-specific assays (38,56) and approaches whereby the allele specific primer(s) are "tailed" with priming sequences for subsequent resolution of polymorphisms located within the initial PCR product, a strategy useful for genotyping highly complex loci possessing multiple polymorphic sites, such as HLA (57). Presently, there is no single SNP genotyping method that is ideal for all research and/or clinical laboratory applications. Commonly used current chemistries include hybridization, primer extension, and cleavage methods coupled to various detection systems. Numerous biotechnology companies have developed elegant and innovative high-throughput systems combining various allelic discrimination biochemistries, reaction formats, and detection methods. In the following subsections are described a number of commercial systems that have found acceptance in the clinical laboratory setting. 4.2. INVADER™ ASSAY The Invader™ assay is a mutation-detection technology developed by Third Wave Technologies, Inc. (58-63). This microtiter plate-formatted assay uses fluorescence resonance energy transfer (FRET) detection and does not require PCR, restriction digestion, or gel electrophoresis. The assay is based on a novel linear signal amplification technology whereby biallelic SNP systems can be genotyped in a single biplex reaction format. The technology relies on the specificity of Cleavase® enzymes, a class of naturally occurring and engineered enzymes that recognize and cleave structures that form when the 3' end of an upstream "invading" oligonucleotide overlaps the hybridization site of the 5' end of a downstream oligonucleotide probe by at least 1 basepair (58,59,64,65). This activity enables detection of single-nucleotide mismatches immediately upstream of the cleavage site on the downstream DNA strand because mispairing results in the formation of a noninvasive structure that the enzyme does not recognize as a cleavable substrate. The generation of the proper enzyme substrate is dependent on base-pairing at a critical position between the two oligonucleotides and the target nucleic acid, which provides the ability to discriminate single-base changes. Figure 2A illustrates how the 3' base of the upstream "Invader oligonucleotide" overlaps with the target-specific region of the "primary probe" (wild-type [WT] or mutant probe) at the base referred to as "position 1." The specificity of the Cleavase enzyme requires that position 1 of the primary probe be complementary to the target for cleavage to occur. A noncomple-mentary base in the target at position 1 does not lead to formation of an invasive structure. Instead, a nicked structure is created, and position 1 of the primary probe becomes part of a flap that does not hybridize to the target. The Cleavase enzyme does not recognize and cleave the nicked structure. The sequence of the 5' flap varies in length (typically between 1 and 15 nucleotides), and because it is independent of the target, it can be any sequence. Discrimination relies on enzymatic recognition of the properly assembled structure in addition to the hybridization thermodynamics of oligonucleotides complementary to the target sequence. When the complementary sequence is present, the Invader oligonucleotide and target-specific region of the primary probe hybridize to the target and form an invasive structure. The Cleavase enzyme removes the 5' flap from the primary probe. Once released, the 5' flap forms another invasive structure with a synthetic molecule containing a donor and a quencher fluo-rophore on each side of the cleavage site (termed "FRET oligonucleotide"). The Cleavase enzyme separates the donor fluorophore from the quencher fluorophore, generating a fluorescent signal. Using two different 5'-flap sequences and their matching FRET oligonueotides with nonoverlapping fluo-rophores allows for two alleles to be detected in a single well (Fig. 2A). Both reactions (cleavage of the primary probes and of the FRET probes) occur simultaneously at a single temperature near the melting temperature of the primary probe. Thus, numerous primary probes and FRET oligos could be cleaved for each target molecule present, resulting in a linear amplification of signal, but not target. Each step of the assay provides approx 5000 cleavage products per target per hour—over 1-million-fold signal amplification without temperature cycling (63). The Invader assay can be carried out in microtiter plates, requires minimal hands-on time, and does not require any separation steps. Invader reactions are run for 3-5 h at 63° C, and the end-point fluorescence signal is detected using a standard fluorescence plate reader. Genotypes for homozygous and heterozygous samples are assigned by determining a net wildtype/mutant signal ratio for each sample (Fig. 2B) using Microsoft Excel-based worksheets. This assay platform has been used for the detection of thousands of different SNPs in research settings (66-71) and a number of "Analyte-Specific Reagent Kits" are available for typing a number of clinically relevant SNPs, including Factor V (Leiden G1691A), prothrombin G20210A, MTHFR C677T, GP1A T1565C (PlA1/PlA2), and others. These kits have shown high concordance with genotyping generated through more traditional methods (47,72-74). 4.3. 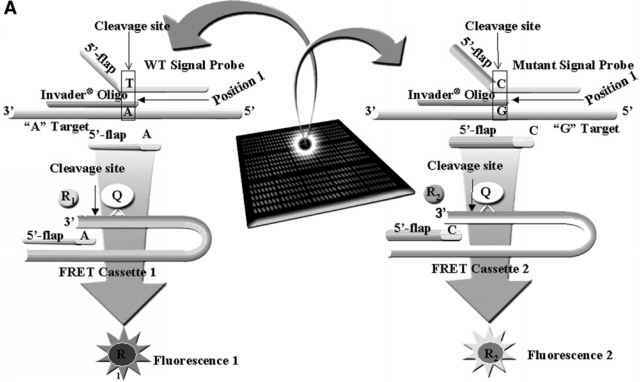 READIT® ASSAY Genotyping System (Promega Corporation, Madison, WI) (Fig.3) The READIT® SNP is a three-step system that interrogates PCR amplified samples for a target sequence and produces a bioluminescent light signal to identify which target sequence is present (75). The assay uses hybridization specificity and a coupled reaction using two thermostable enzymes (READase™ Polymerase and READase™ Kinase) to generate high-energy adenosine triphosphate (ATP). When luciferase/luciferin reagent is added, the ATP is used to produce light detectable with a luminometer. The READIT technology, capable of detecting SNPs, insertions, deletions, and chromosomal translocations, utilizes the ability of DNA polymerases to catalyze hybridization-dependent pyrophosphorolysis (75-78). Pyrophosphorolysis is the addition of inorganic pyrophosphate across the terminal phosphodi-ester bond, resulting in the shortening of the 3' end of the DNA substrate and the release of dNTPs. In the case of interrogation of a sample having a biallelic genome, one READIT reaction contains an oligonucleotide probe that can hybridize to one of the known alleles that might be present at the variable site. A second separate but concurrent READIT reaction contains a second oligonucleotide probe that can hybridize to the other known allele. A third separate but concurrent reaction is performed without any added probe to assess background signal from the template. As such, three wells of plate are used to determine each genotype. 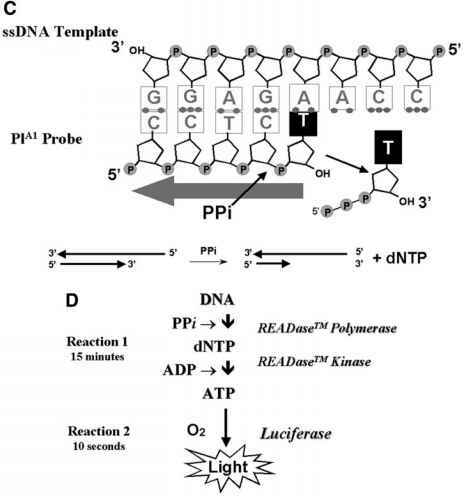 If the probe hybridizes to the target DNA without a mismatched base within the final six bases at the 3' end of the probe, an enzyme designated the READase polymerase will carry out a pyrophosphorylation reaction on the primer, generating high-energy dNTPs. If there is a mismatched base within the last bases at the 3' end of the probe, the READase polymerase will not generate dNTPs from the primer. If dNTPs are generated, a second enzyme present in the reaction (the READase Kinase) will transfer the terminal phosphate from the dNTP to ADP present in the reaction buffer to form ATP. ATP is an essential cofactor in a reaction with luciferase and luciferin that produces light, and the light is used to monitor ATP production. The amount of ATP produced by the reactions is then measured in a second incubation as a light signal generated by a luciferase/luciferin reaction. If a sample is homozygous for one of the alleles, dNTP, then ATP will only be generated in the reaction using the probe that matches that allele. However, if a sample is heterozygous for the alleles in question, essentially equal light signals will be seen in the reactions with both probes. In order to "clean up" a PCR product prior to READIT assay molecular interrogation, the double-stranded DNA is subjected to enzymatic processing to remove one of two strands of the PCR product as well as to remove residual dNTPs from the spent PCR reactions that would contribute to background in the READIT assay. To protect the strand of the PCR product to be interrogated, one of the two PCR primers must contain three phosphorothioate linkages at the 5' end of the primer. This modified linkage prevents digestion of this strand during exonuclease treatment. Although either strand of a double-stranded PCR product can be interrogated, it is critical that the READIT Interrogation Probes be complementary to the strand containing the modified primer. Software to assist in READIT Interrogation Probe design is available on the Internet (www.promega.com/readit). Fig. 3. The READIT assay from Promega Corporation (Madison, WI) utilizes the fact DNA polymerases catalyze hybridization-dependent pyrophosphorolysis, which is the addition of inorganic pyrophosphate across the terminal phosphodiester bond. This results in the shortening of the 3' end of a DNA probe and the release of dNTPs, when there is recognition between the probe and the target. The analysis of a biallelic polymorphism, such as GPIIIa PlA1/PlA2, begins with amplification of the locus. (A) where one primer of the primer pair is 5'-modified with 3 phosphorothioate linkages. A single-stranded DNA template is generated by treating the PCR product with exonuclease; the 5' phosphoroth-ioate linkages protect the READITTM substrate strand from degradation. 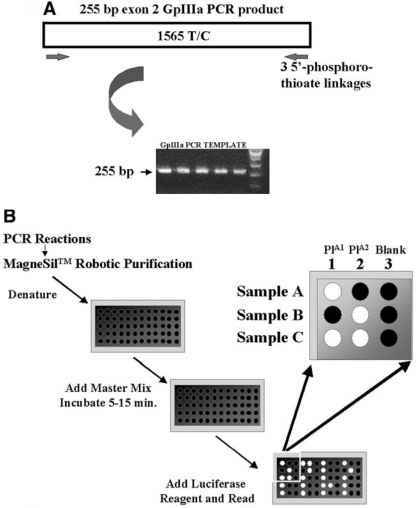 A single-stranded DNA template is purified from PCR components and digestion products using Promega's MagneSil™ System. Single-stranded DNA template is interrogated in three reactions. (B) In the first reaction, a PlA1-specific probe is positioned such that the 3'end corresponds to 1565T; likewise, the second reaction possesses a PlA2-specific probe positioned such that the 3' end corresponds to 1565C. (C) The READIT reaction is conducted at an elevated temperature and only perfect hybrids will serve as substrates for DNA polymerase-mediated pyrophosphorolysis resulting in depolymerization of the interrogation oligonu-cleotide and the liberation of dNTPs. A third reaction lacks interrogation probe and serves as a background control. A kinase present in the REA-DIT reaction is responsible for randomizing the y- phosphate present on the released dNTPs onto ADP present in the reaction to produce ATP. (D) Once generated, ATP is utilized by luciferase to generate light in reactions where hybridization has occurred. The READIT assay system can be conducted in a 96-well format on robotic workstations for high-throughput applications. using the READIT system. This program also can be used to track the performance of the system over time and can calculate the population frequencies of the various genotypes analyzed. 4.4. MICROCHIPS (AFFYMETRIX) Affymetrix has developed an interesting technology that utilizes the hybridization of DNA onto a solid support bound oligonu-cleotide, enabling the simultaneous genotyping of a large number of SNPs. Although the chip technology can be utilized also for expression analysis, it can also be used for SNP genotyping. The methodology is based on an array of oligonucleotides, that are synthesized on glass using a process utilizing photolithographic and combinatorial chemistry. the chip and the accurate attachment of the nucleotides. For SNP genotyping, oligonucleotides are synthesized that are complementary to the SNP of interest with all four different nucleotides at the respective SNP position. SNP typing will then be performed by hybridization of PCR products onto the chip. For the hybridization as well as the measurement and scoring, a workstation provided by Affymetrix is necessary to perform the analysis. The most expensive step for the design of these chips is the manufacturing of the chip-specific masks. Therefore, the strength of method might not be fully utilized for the analysis of a small number of custom SNPs. 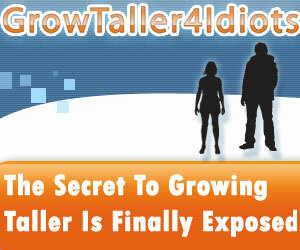 The strength of this technology might rather be in the simultaneous analysis of a panel or a large number of SNPs. Although custom chips are available (e.g., the CYP polymorphisms), this technology could be utilized with a fixed set of SNP for whole-genome SNP association analysis in a research setting. In addition, for diagnostic purposes, custom chips could be designed that which analyze a larger set of diagnostic SNPs as part of a comprehensive SNP screen. 4.5. TAQMAN The TaqMan assay (Applied Biosystems, Foster City, CA) (Fig.4) utilizes the same biochemical approach as been implemented in quantitative PCR analysis. The methodology that is available from Applied Biosystems uses energy transfer as it detects fluorescence based on the physical distance between a fluorophore and a quencher molecule. Fig. 4. The TaqMan assay (Applied Biosystems) utilizes the 5'-exonuclease activity of DNA polymerases. The TaqMan assay is homogeneous in that it possesses in each reaction allele-specific probes that are labeled with different fluorophores at their 3' ends and a quencher molecule at their 5' ends. (A). The quencher, through FRET, quenches fluorescence as long as the probe molecule is intact. During the annealing phase of PCR, the probes hybridize to their appropriate PCR product target strand, and during the extension phase of PCR, the 5' exonuclease activity of the Taq polymerase degrades perfectly matched and annealed probes (B). The digested probe is released into solution and the fluorophore and quencher are separated, leading to an allele-specific increase in fluorescence with each cycle of PCR (C). Mismatched probes are displaced from the PCR product target strand without digestion. cost of the probes represents also a significant factor making this method particularly suitable for projects with higher numbers of genotypes. Most recently, predesigned assays are available (assay on demand ™). This set of over 200,000 SNPs with predetermined allele frequency in selected populations can be used for mapping using association analysis in a research setting as well as for diagnostic analysis if the mutation of interest is available. The methods described in this chapter provide only a limited overview for the numerous SNP typing methods available because new technologies are rapidly evolving. Taken together, the strengths as well as limitations for each assay relate to the ease of establishing an assay, the ability to either type a large number of samples with a limited set of SNPs or a large number of diverse SNPs, and, most importantly, the cost of geno-typing. With the technology available as of today, there might not be one single platform, that will fit the need for the broad range of applications in both a diagnostic as well as a research setting. Although sequencing is still the standard for the identification of novel SNPs, new technologies are emerging that potentially reduce the cost and effort of sequencing through a reduction of reaction volumes and automation. 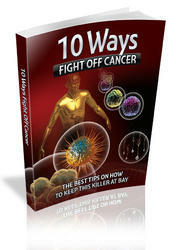 A reduction in cost and time might also be achieved in assays, which do not require PCR. Ultimately, one can envision that for research applications, potentially hundreds of thousands of SNPs might be typed in order to perform genomewide association studies. For these applications, highest-throughput methods will be needed and further improvements reducing the cost will be necessary. As more and more disease-causing mutations are identified, one might perform in a diagnostic setting an analysis with a set of a few hundred or thousand SNPs with demonstrated clinical relevance. Ultimately, the ability to assay a whole genome for its polymorphic structure by direct re-sequencing of each individuals genome might be the most comprehensive analysis. So far, for only a few diseases, the genetic information is being used for diagnosis or a decision on the treatment options. With the focus on the improvement of SNP typing and sequencing, well-designed clinical and epidemio-logical studies are ultimately the key to correlate genetic variation with disease, treatment, and prevention.